Please join me at my office to welcome Nomi Prins, author of “Collusion,” for a special event. (We will have a limited number of books for purchase at the event. When the market broke above the 100-dma, we used some of the cash we had raised on previous rallies to increase the allocation to equities in our portfolios. However, we still maintain an overweight position on cash currently as a hedge against potential market risk. Unfortunately, the market was unable to gather enough steam to make the break and remained below the current downtrend resistance line. This keeps our portfolio allocations on hold currently. I also noted that I would need to update our three potential “pathways” this week as well. As shown by the reddish triangle, the ongoing consolidation process continues. Eventually, this will end with either a bullish or bearish conclusion. There is no “middle ground” to be had here. We will continue to hold our cash position until the market makes some determination as to its direction. “More dovish (than expected) Fed comments contributed to a midday reversal in the averages in Wednesday’s trading session. Tactically, I believe that the rally will be short-lived and that, the current high end of the recent trading range (since early February), will prove to be difficult to overcome over the near term. My concerns are multiple. Most importantly, we are in an advanced economic and market cycle. The cracks in the foundation of global growth have already surfaced – seen quite visibly in the submergence of the emerging markets over the last five weeks and the growing signs of ambiguity with regard to world-wide economic growth (see this week’s European PMIs, the two year low in Citigroup’s European Economic Surprise Index and the downturn in the global economic Surprise Index). Bears have been frustrated by the lack of follow through. But the structural supply of listed companies (down from about 7800 in 1999 to 3900 today) and the reduction of the shares outstanding (by 17%) of the remaining public companies when coupled with still steady buying from non-economic players (e.g.,central banks and sovereign wealth funds) buying of stocks and massive money committed to passive products and strategies have limited downside vulnerability and, frankly, has destroyed price discovery. Bulls have been frustrated by the inability of sales and profit beats to catalyze the markets. With interest rates and inflation rising and the Federal Reserve retreating from QE — the liquidity that provided a catalyst to the near decade Bull Market are being removed. I agree with his points, and “cash” as an alternative has served us well over the last couple of months. This is particularly the case given the market offers much more risk than reward currently and the risk of a bigger correction later this year is an increasing possibility. The big surprise on Friday was the expected reversion in both oil prices and interest rates. As I showed earlier this month, with everyone on the same side of the boat, it was only a function of time until a rising dollar and interest rates collided with oil prices. The massive positioning was not only in oil, but short bonds as well. On Friday, “something broke” as rates fell by 1.68% and oil plunged by 4.51%. 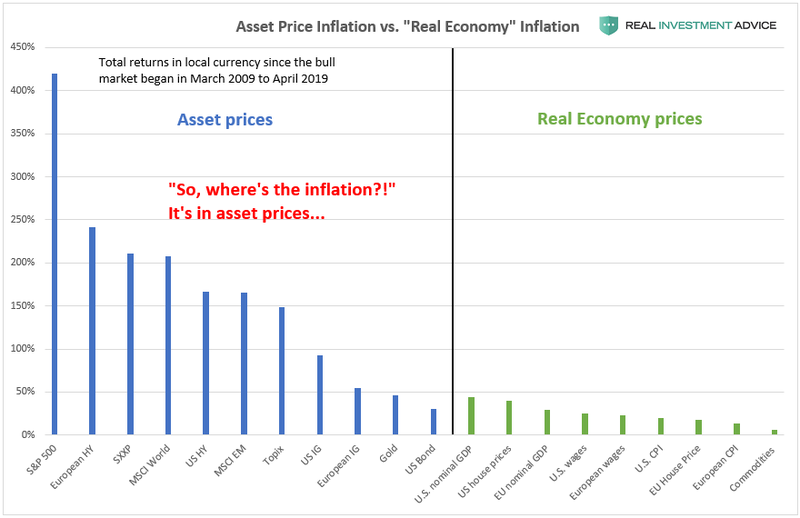 The more important problem is the rise in inflationary pressures, which has had the Fed focused on lifting rates further. The problem is the bulk of the “rise” has been driven by rising oil prices. Unfortunately, rising input costs detract from disposable household incomes on an already cash-strapped consumer. This is the wrong type of inflationary rise which negatively impacts economic growth. As opposed to rising prices driven by rising demand, cost-push inflation simply eats away at discretionary incomes reducing consumptive spending which is 70% of economic growth. Recently financial advisor Ben Carlson wrote about why bonds are still useful for many investors. The argument comes down to psychology and volatility. After all, high-quality bonds tend to hold up when stocks hiccup. And although inflation can hurt them, accepting that risk has been a reasonable price to pay for the downside protection bonds provide during economic slowdowns, times of fear, and episodes of stock market retreats from over-valuation. Everyone needs a shock absorber in a portfolio, and bonds have served that role reasonably well. If having a lower volatility portfolio prevents you from selling stocks after big declines, then bonds have done their job. The “spreadsheet answer” on how to allocate capital, according to Carlson, differs from the psychological answer. The spreadsheet answer says young investors should simply own stocks. Since 1926, Carlson notes, stocks have outperformed bonds more than 85% of the time on all rolling 15-year periods calculated on a monthly basis. But, because most people can’t tolerate the volatility of a pure stock portfolio, some bonds are required even for young, aggressive investors. The problem with both the psychological and spreadsheet answers to the allocation question is that neither of them take valuation and prospective returns into consideration. Are stocks always poised to outperform bonds over long periods? And just how long is long? A decade? Two decades? Carlson is perhaps too sure of answers to these questions. Most investors don’t have, say, five decades. Recently, Boston-based asset management firm, Grantham, Mayo, van Oterloo (GMO), forecasted that over the next 7 years U.S. bonds (both nominal and inflation-protected) would outperform stocks around the world, save those from emerging markets. Prospective bond returns aren’t exciting, with plain U.S. bonds poised to lose .020% to inflation annually and inflation-linked bonds set to lose 0.40% annually to inflation. But, by GMO’s lights, U.S. bonds and U.S. inflation-linked bonds could outstrip U.S. large cap stocks by 4 and 3.8 percentage points, respectively, on an annualized basis. No forecast is perfect. While nominal bond returns are usually close to bond yield-to-maturity, inflation is unknown. Regarding stocks, future real returns are even harder to forecast. Not only is inflation unknown, but so are future earnings-per-share growth and multiples. It’s possible to combine the market’s current 2% dividend yield with historical 4%-5% earnings-per-share growth to arrive at a 6%-7% annualized nominal return forecast. But will stocks trade at a 30+ CAPE ratio in 7 years, as they do now? It’s not impossible, but it’s unlikely given that the two previous times in history the CAPE has displayed such high readings have been in the runups to the 1929 and 2000 peaks. So, overall, it looks like stocks are priced to lag bonds over the next 7-year period. And although bonds might deliver higher returns than stocks over the next decade, that’s not necessarily an argument to fill your portfolio with them. There’s very little difference in yield right now between short-term bonds (two-year maturities or less) and longer-term bonds. It’s possible that rates will come back down, making longer-term bonds a better deal. But if you think rates are on their way up – or at least not going back down in a meaningful way – -then short-term bonds, which are almost cash equivalents are better. That’s how GMO has arranged the portfolio of the Wells Fargo Absolute Return fund (WARAX), for example, which has more than 20% of its assets in U.S. Treasuries of 3-year maturities or less. All of this means that bonds still have a place in most people’s portfolios. In fact, as interest rates have been rising, bonds are looking more attractive. The starting yield-to-maturity often indicates an investor’s return from bonds. Below is a list of some money market funds, bond funds (mostly shorter term to intermediate term), savings accounts and their yields. The yields aren’t mouth-watering yet, but they represent some relief from the nearly decade-long income drought for yield-starved investors. Discretionary stocks have been leading the market as of late. However, pay attention to the price compression currently forming. A downside break could lead to a rather sharp decline, so taking some profits from the sector is advisable. Energy led the decline last week as oil prices pushed fell back below $70/bbl. As discussed above, the profit taking last week proved prudent. We are likely not done with the correction yet particularly if the dollar continues to strengthen. Taking profits and under-weighting the sector currently remains advisable. Technology, Financials, Industrials, Materials, and Health Care held above their respective 50-dma’s last week and consolidated their recent advance. Materials and Health Care are currently the least attractive of the group with their respective 50-dma’s below their 200-dma’s. Remain underweight these two sectors for now. Staples – there is a potential rotation trade being built in this sector as performance did improve again last week. It is too soon to buy into staples just yet, but we may be getting close to a decent trading opportunity. We are watching closely particularly as we move into the summer months. Utilities had a nice rally last week back above its 50-dma as money rotated into the Utilities (and Bonds) on a “risk off” trade. We remain out of the sector for now, but the rally last week has caught our attention. We need some confirmation of sustainability and we watch performance next week. Bonds and REITs – were the big winners last week. Just about the time you see articles declaring the “bond bull” dead, it is usually time to start buying interest rate sensitive sectors. We remain out of trading positions currently, but remain long “core” bond holdings mostly in floating rate and shorter duration exposure. However, we are watching Staples and Utilities closely for a “counter-rotation” trade being set up. Nothing much changed as of last week, as markets still remain tightly range bound. The weakness in the market that doesn’t violate support, will allow us to average into our positions at better prices. Otherwise, we will get stopped out of our positions and look for other opportunities. This week, the instructions remain the same.